Olympics got you hankering for a higher performance bod? 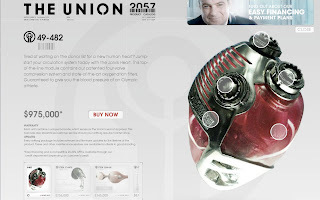 Check out a new website where you can put in an order for a bionic arm that "handles twice the load of a human arm" (special 2 for 1 pricing) or a human heart "guaranteed to give you the blood pressure of an Olympic athlete." Faux site may not sell many organs but my guess is, it will be brilliantly effective at what it's intended to do: get you to shell out $12 for a ticket to an upcoming film. Repo Men, starring Jude Law as reclaimer of bionic body parts from unfortunate buyers behind on their payments, is due out March 19. Faux website courtesy of Goodness Mfg, LA ad agency staffed by creatives from Crispin. I was way taken in by those Sarah Marshall posters, too, Amy. Thought some wronged boyfriend had grafitti-d our subway stop. Loved discovering it was an ad campaign.